Good morning! 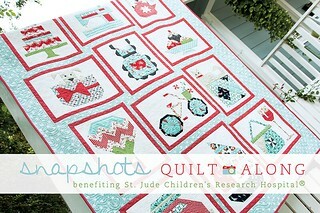 Today its time to talk about the Snapshots Quilt Along with Fat Quarter Shop. I'm excited to be a part of this great project benefiting the St. Jude Children's Research Hospital. Every month on the 15th, beginning in January, you can download a cute block to make. The blocks are free, but we're encouraging you to donate $5 towards St. Jude's for each download. Additionally on the 15th of each month, Fat Quarter Shop will be releasing a new video tutorial on each of the blocks. And check out this great introductory video with Bonnie and Camille ! It has all the details. You can read all the details here, and see who else will be sewing along with us! I hope you'll join in the fun! I can't wait to see it in Pam Kitty Garden. Your new fabric is simply scrumptious. I'm hoping to sew along!